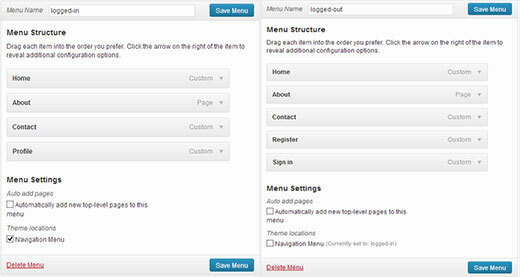 In WordPress even if your theme has one menu location, you can still create multiple menus for the same location. Go to Appearance » Menus, create two menus logged-in and logged-out. That’s all you will see that your logged in visitors will see the logged-in menu and non-registered or logged out users will see a different menu. This method allows you to create two different menus for your users so that you can freely update your menus for logged in or logged out users. There are other ways to do the same thing. For example, if you just want to add login and logout links to your navigation menu then you should add custom menu items in WordPress navigation menu. We hope this article helped you show different menus to logged in users in your WordPress site. For questions and feedback please leave a comment below. 100%. Just configured it with Sahifa Theme and works like a charm. Keep up with this good work. this is so helpful, but is there a way to display a username and avatar which can act as a container of other profile menu items, as a drop-down menu? The path you showed is well and good only for just showing custom menus. But what if i want to show my content to a specific logged in user based on his interests. That is in detail, like various deals sites, when we login and save our interests, the next moment we see deals only on that specific topic. Can we make that possible using WordPress plugins. Hey there, thanks for the great work. I have a question about multiple user roles. So I have two main menus, Menu 1 and Menu 2. I would like all users (logged in or out) to see the main menu unless they have the userole of “Alt”, in which case Menu 1 is replaced by Menu 2. @ERICLEE You can create a child theme to prevent that from happening. I just added this code and need to do the same thing. can it possible to add the menus in the subscriber profile accept than the home page these menu pages not show on the home page, just on the every subscriber profile. if it possible then please guide me, and tell me how use any pluging for this. can it possible to add the menus in profile of the subscriber in wp site , if it possible so please anyone guide me what i do and how use any pluging of this work. How can the same be achieeved on a multi-language members site? For example show different menu for users logged in in english and a different menu for users logged in with german? If you are using a multilingual WordPress plugin then this should be handled by the plugin. You will essentially need to provide translations for your multilingual menus. First I thought of a plugin. Gotta quit thinking like that. Then I saw your post and was sold. Thank you for posting this, you helped me very nicely. Thanks so much for that. Works perfectly. But it change my footer menu too.. is there a way where my footer manu stay the same? So, I have 2 menus. One for the public and another that I would like employees to see when they are logged in. The employee menu would replace the main menu only when an employee is logged in. When I log in as an employee both menus are showing. its not working for me. It display default menu after I add this code, even my primary menu gone. I nice tutorial but i was wondering could you use the same approach to replace a responsive menu at a certain screen size? I have two menus but would rather have just one responsive menu at 768 px by replacing the menu with another. Awesome job with your guides. I am building my first wordpress site and I am finding your site incredibly helpful in guiding me along, thank you. I really wanted to show different menus for logged in users (like ‘edit profile’) and for logged out users and that brought me here. The code you shared works alright for me. I now have two menus which are showing up nice. However, the last part of the code, add filter string, I believe, is messing me up a little bit. Now, another menu is showing under the sidebar widget. The ‘logged-in’ menu. I am using sydney theme and I have tried to no avail to remove this unnecessary menu. Any idea on how I can make it not display? Please check Appearance » Widgets page to see if you have a custom menu added as a widget there. If it is there then you can just delete that widget. What genius! It worked! Thanks for the wonderful tip!! Me too have the same problem..Please help me..but I dont have widgets..Thank you..! Hi can you help me please? I have another trouble please? I need to hide one menu to all and allow only the vendors to see what I have to do please? what is the specific code i have to use please? When you modify the functions.php like so- wouldn’t it get wiped when you upgrade your WP next version ? Yes, it will get wiped out when you update your theme. To prevent this you can create a site-specific plugin. Will this work for a Buddypress install? Thanks. this above function set secondary menu all i want to set only header menu? thanks a lot for this solution, I’ve applied and woks perfect and saved me installing one more plugin. If I want to hide a page from logged out user from a single menu what have to do? You can lock pages to hide them from logged out users. There are several plugins that make this very easy to do. Users Ultra comes to mind. However, I still have the issue of a repeated primary menu in the secondary navigation menu section which I can’t seem to remove (I don’t have a secondary menu set up). I’m having the exact issue. The change reflects in the secondary menu location out of nowhere and I too don’t have a secondary menu setup. :/ Please advice how to deal with it. Most of us, uses themes. So first go to the functions.php of your theme. Search with navigation as keyword. In case of Shopkeeper theme.. I used the following code and worked like a charm!!! This is my way of thanking the author. Here’s what worked for me with WP . I used this to create a specific primary menu for logged-in Buddypress users. It will NOT affect my footer menu OR social media menu for any visitors, so everyone sees the same secondary menus regardless of whether they’re logged in or not. This is based on all of the comments above (HT to Fransiska!). Don’t know what happened why my comment, but –> ” <– these are correct! I added this code (probably wrongly) in my functions.php within my theme in wordpress editor and now I have a constant 500 server error. Even after removing the code. Before this i attempted to create a site specific plugin but that didnt work. Could you please tell me if the snippet requires an opening and closing bracket? My host cant help me now and they’re requesting I pay a programmer to help me for 50Eu per hour. Please help me. Its urgent. I am still logged into wordpress but what ever I click I get the 500 error with this specific error. PHP Parse error: syntax error, unexpected ‘}’ in line 1194. This is because I pasted the snippet after all the text in the functions.php file. I then removed the snippet to see if that would fix it, via editor and FTP and I still get the error. If this code is the last thing in the functions file then you don’t need to add a closing tag. This does not work, anyone that does know the proper code if you have 2 or more menus? Thanks alot for the simple article. In this way I don’t have to install any plugin.. Creating two separate menus like this, use has to create/update menu twice. I’m curious to know why you feel using the plugin is better, than coding the functions.php file? I was told a while ago to watch how many plugins are actually used for a wordpress site, and the code above seems simple enough; minus the having to monitor every time your theme updates…. Great, how I can use it to show menu for logged user that have certain role? This worked so simply and neatly. I didn’t think it would be this easy. Thank you! Thanks. Working with menu functions for the first time. Creating the WTG Portal Manager plugin which will allow a portal to be defined very quickly. Every portal having it’s own menu. The plugin make the relationship between portal and menu clearer plus provide other unique options. how can i show different posts to different users?? thnkx for the help.. but what if i want to show different users different posts on my site.. is there any way to do that using coding?? Under Appearance > Menus you need to choose a location for your menu. Seems like there are two areas on your site where you can add menus. So you need to create two different menus and then assign a location to them. what would the revised code for this be, if there was a distinction of ‘Primary’ and ‘Top’? I have a top menu as well as a site menu (under logo). How would I change the code to switch just that top menu. Right now, ALL my menus change. OMG, this made me laugh it was so simple… thank you! Illustrative and easy, thank you so much. On the homepage, menu names that have a submenu (a drop-down menu) do not show the drop-down. When I go to any other page that isn’t my homepage, this isn’t a problem, and all menu items are shown. Seems like a theme issue. Contact your theme support. into $args[‘secondary-menu’] = ‘logged-in’; for example. Should do the trick! That code doesn’t work. I have registered a ‘primary-menu’ and ‘secondary-menu’ and trying the function provided with your change in args no menú changes. NOTE: ‘ Principal is the name of the primary static menu. So close, both my footer and main menus are changing. I’m trying to just change my footer menu. I’ve tried so many variations of this code but no dice. Any solution thoughts? When I inspected my theme with Firebug it said my footer is “id=footer-nav”. Should I use this name rather than “secondary-menu”?